Conservatives: They see that the Liberals are stalled in the polls, and are looking for Ignatieff to suffer the people’s wrath, as he wears the responsibility for plunging the country into an election with all of his fiery rhetoric. Also, Ignatieff is imperiling the delivery of stimulus spending, especially if the Liberals vote against the home repair tax benefit schedule. Harper will be telling Canadians to give him a majority to thwart these arrogant Liberals. Liberals: They have nothing to lose and everything to gain with an election call, and everything to lose and nothing to gain if they back down, yet again, from their rhetoric. The Liberals are counting on another minority government situation, hopefully (from their point of view), one which they will lead. Either a Conservative Minority or a Liberal Minority are completely within the realm of probability, given recent polling. In any event, the Liberals will gain seats, at the expense of the NDP in part. With a minority situation, it will be clear to Canadians, and more importantly to members of his own Party, that Harper can’t win a majority, so he will have to step aside either way; Harper won’t be able to fight another election as Conservative Leader, not unless he wins a majority. Another defeat of the NDP, with a retreating NDP seat count, will also spell the end of Layton. The only thing which might save Layton is if he enters into some sort of coalition with the Liberals. With Harper and Layton out of the way, Iggy will have positioned himself as the Senior Leader with a good seat count, and maybe even as the Prime Minister of a minority government. And he will fight the NEXT election for a majority. NDP: Layton smells an opportunity to increase his numbers, as Canadians are clearly growing tired of the nonsense from the Liberals and Conservatives. This talk about Iggy and Harper being the flip sides of the same coin is starting to resonate with people, and he’ll be hoping to improve the NDP’s vote count on that basis alone: he’s neither Harper or Ignatieff. All he has to do is offer up some vague policy, likely small-ticket items like credit card and EI reform, and point to himself as an alternative. I really do predict that the NDP will gain in their percentage of the popular vote in a fall election; I’m just not sure that it will translate into more seats for the NDP. In fact, I don’t believe it will. Also, this would be a bizarre time for Jack to finally support the Conservatives, after all of those votes against the government. To stay true to his ideological roots (which, admittedly, have never been Jack’s big concern), he’s going to have to vote against the government again. Bloc: Both the Liberals and Conservatives have stalled in Quebec. Duceppe would likely come out of what he sees as an inevitable election with an increased seat count. John Northey believes the Bloc might initially support the Conservatives in early September, and I think there’s merit to that, as Duceppe is wily enough to do just that. I mean, can you imagine the headlines in English Canada? "Bloc Saves Conservative Government!". But Duceppe knows that there’s no good reason to continue supporting Harper; he can smell the blood. And with Ignatieff stalled in Quebec too, well, why not bring it on now? We could use another year to organize. An election right now is not in our interests, and we should be doing everything that we can to encourage the other Parties to "play nicely" and to move on with the work of actually governing. Instead, we’ve done nothing of the sort, having quietly disappeared from the mainstream media, but hopefully not from the public’s thinking. Indeed, if we play our cards right, we could tap into some of that growing public disenchantment with the Conservative/Liberal dichotomy that Jack Layton is hoping will benefit his party. A strategic push to capitalize now on disenfranchised small "c" conservative and centrist voters is what we should be focussing on in the next campaign. In other words, we need to present ourselves as an environmentally conscious, progressive conservative party. I mean, heck, our Leader played a significant role in the last progressive conservative party with an environmental conscience of some sort in Canada. If we’re going to increase our vote count, that’s what we have to do. But to do so, we’re going to have to figure out some way of convincing voters that we really don’t occupy the loopy left of the political spectrum, out there somewhere even beyond the NDP. That’s going to be a challenge. Can we pull it off? Depends on what our key messages are going to be, and how we execute the delivery of those messages. Local campaigns are already going to be hampered by the fact that our Leader is going to have much less of a national profile during this election, and not just because it’s quite likely she will not be invited to participate in the Leadership debates. Mainstream media has largely written us all already, and with the focus of this election on Michael Ignatieff and the Liberal vs. Conservative story, it’s going to be very difficult for her to generate anything much in the way of national airtime. Also, given that our Leader will likely be "staying at home" much of this election, there will be few opportunities for Greens to build momentum outside of B.C. by having her come to town for rallies, etc., which we have in the past used to get our pictures in the papers. And finally, British Columbia is three hours behind Ontario, so campaigns here will be impacted by the timing of the newscycle. Unless she makes significant announcements before 11AM B.C. time, the Ontario Campaigns will not be able to take advantage, as any "significant" announcement is generally only good for the day it was announced during an election campaign. Extremely careful co-ordination between the national and local campaigns is going to be necessary. So maybe start sending those letters to the editors, telling voters that the Green Party does not want an election at this time, as polls show Canadians have no desire for more of this nonsense. An election right now will occur only as a result of political game playing, not because it’s needed. Of course, we’ll be ready to fight when the time comes, sure, but right now the government has more important business to attend to, such as fixing the economy and getting ready for a Canadian position for Copenhagen. Why can’t those other parties just get along, for the good of the nation? 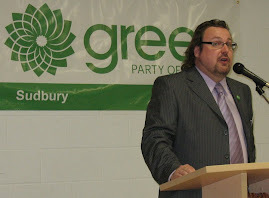 Sudbury Greens Attend "Global Solidarity Rally"